BINUS UNIVERSITY – School of Design stands at the forefront of collaboration opportunities to deliver excellence in design education. Currently in charge of internationalisation efforts and otherwise an artist and lecturer at the School of Design herself, Ms Hanny Wijaya has recently initiated efforts to work closely with Adobe, reputable regional schools, and even the chief medal designer for the 2008 Beijing Olympics to educate top future designers. With its Adobe Creative Clouds initiative, Hanny sees “Adobe as an instrument to connect generations X, Y, and Z” in education settings allowing teachers and students to collaborate using mobile devices. 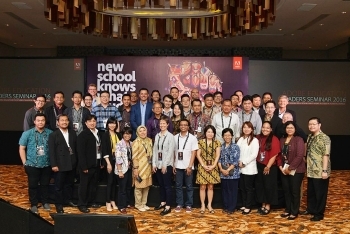 As a serious consumer of the Adobe package for teaching and learning, the school is annually invited to participate in Adobe Education Leaders Seminars. This April, interest groups discussed how to keep education relevant to ensure student success. Discussions are underway to explore opportunities for curricular collaborations and how to make Creative Clouds affordably available in the region to ensure the delivery of top education in Indonesia. With numerous higher education partners in the region, the school is concurrently working on collaboration projects to build knowledge sharing networks. In 2013, BINUS UNIVERSITY – School of Design hosted and regularly participated as a member of the Neighbour Programme Southeast Asia. The programme brings top students and their coaches together for one week where skills are learned and applied. When BINUS UNIVERSITY hosted the event, textiles were explored as a raw material in different aspects of design from fashion to products. The university has also joined Linking Cities, an expanding regional research programme initiated by LASALLE College of the Arts, Singapore looking to enhance the research process driving artwork design in Asia. An event for this programme is set to take place in August. Joint competition is yet another avenue being pursued by the school to encourage individual students to network, explore cultures, and compete with creative design solutions. From June to October students will explore different regional concepts of Peranakan (individuals of mixed Chinese and Indonesian/Malay descent) and their artwork will be judged by both academics and professionals. The university is also collaborating with Central Academy of Fine Arts Beijing – China, King Mongkut’s University of Technology Thonburi – Thailand, LASALLE College of the Arts, and First Media Design School – Singapore to remove obstacles to student and faculty exchanges. Drawing upon her experience in this regard, Ms Wijaya in May held a guest lecture at First Media Design School to teach theoretical concepts using practical methods. She will also teach and conduct research as part of a faculty exchange programme between BINUS UNIVERSITY – School of Design and LASALLE College of the Arts in August for approximately 3 weeks. Last but not least, in mid-May BINUS students also enjoyed an exclusive seminar and workshop by Professor Xiao Yong, the chief medal designer of the 2008 Beijing Olympics who has taught at more than 350 universities in the world. He is also an Executive Board Member of CUMULUS Association (2016-2018). The seminar focused on educational and professional perspectives of design in China, while the workshop looked specifically at male/female differences through design and symbolisation.